Michael Giampa, age 45, passed away in January of 2012, from Glioblastoma Multiforme Stage 4 Terminal Brain Cancer, the most aggressive form of brain cancer. It’s the same disease that took the life of Senator Ted Kennedy. Mike's Christmas 2010 diagnosis presented an unanticipated sorrow that few could have ever prepared for. While undergoing intense treatment, healthy diet and vigorous exercise, Mike still needed to shoulder the responsibilities to support his wife Ulla and his three children, ages 6, 8, and 12. Mike’s wife Ulla was suffering from a chronic illness that left her unable to work or get out of bed many days. Michael was a graduate of Palatine High School and Memphis State University. He was also well known in the musical community. Michael loved God and saw his situation as a blessing. He was an active member in his church Harvest Bible Chapel in Gurnee. Funds from our outing went to help Mike and his family pay for medical bills. We met and sponsored Cody for 2 years. Cody recently turned 6 years old and he's been going through his cancer fight since the age of 2 months. He's a brave little warrior! Cody still suffers from Multi-System Langerhan's Cell Histiocytosis, Von Willebrand's Disease and Bilateral Reflux. Langerhans Cell Histiocytosis (LCH) is an extremely rare white blood cell disease that affects 1 in 200,000. Confirmed when he was 2 months of age. LCH is a chronic, debilitating and life-threatening disease, similar in nature to cancer, that affects more than one part of the body. He continues to endure countless surgeries and procedures, including six colonoscopies and endoscopies, more than eight port related surgeries and a bone marrow aspiration. He has spent his entire youth on chemotherapy and steroid treatments. He takes a second form of chemotherapy on a weekly basis, in addition to monthly chemo treatmentsand to this day is still receiving intravenous chemotherapy treatments three consecutive days each month from both the hospital and home health care. Cody is truly inspirational and one of the sweetest children you will meet. He is a fighter and a true angel in every sense of the word. He wants nothing more than to not be tired and sick all of the time and to just be “normal”. His compassion for others and his strength in himself melts, and breaks, your heart. His big brother Sean Thomas reads him stories each night and takes good care of little brother. He just wants his little brother to be better. To take care of Cody and provide him with the constant care that he requires, Cody’s mom has had to stay home from work the past four years. Additionally, his dad took a considerable pay cut at work three years ago. These circumstances, combined with the mounting medical bills from over four years of surgeries and constant medical care, have financially strained the Neilson Family who struggle on a daily basis to make ends meet. The donations from our outins helped them tremendously. Lisa Serio is the proud wife to Dan and mother of two children, 12 year old Nick and 9 year old Lauren. 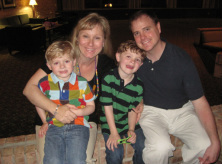 Lisa was diagnosed with a very rare smooth muscle cancer known as Leiomyosarcoma (LMS). The initial tumor was discovered by chance after an unrelated procedure and thankfully, a most recent surgery does not show any further tumor growth at this time. Like the Doctor has said, now they can play offense instead of defense. As a NICU nurse at Lutheran General, Lisa knows her way around a hospital, but not as a patient. Funds raised from our outing helped decrease the burden the Serio’s were experiencing as they began the fight for Lisa’s life. Jinene Favia has been married to Pete for 20 years and together they have two children, son Giacomo is 15 and daughter Raquel is 14. She found a lump on her right breast in December 2010. A biopsy came up positive for "Lobular Invasive Breast Cancer" no node positive with the possibility of some chemo and no radiation. She received a double mastectomy on Dec. 21, 2010 and her cancer went from stage 1 to stage 3C, hormone sensitive (hormones in my body would be a vitamin for the tumors), with 21 out of 22 lymph nodes positive. On January 20th (4weeks later) she had an offarectomy (ovarian removal) in hopes that the tumors would not spread and feed on the hormones in that area. As of January 2011 Jinene was "cancer free" and with all of the treatments hope to keep it that way. Funds from our outing helped pay their medical bills. It's the way you carry it"